The Mission of Beller Dental Clinic is to promote oral health through excellence in education, patient care, technology, and service. Let Beller Dental Clinic be your clinic of choice for all dental needs. 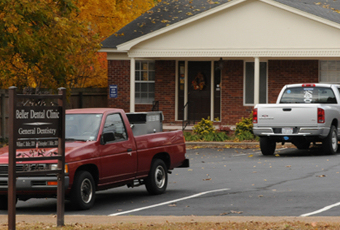 Located in beautiful historic downtown Batesville, AR, Beller Dental Clinic was founded in 1968 by Dr. William Beller. In 2003 he was joined by son, Dr. Chris Beller. Together, along with eight professional staff members we offer many services, including: implant placement, implant restoration, same day crowns, cosmetic dentistry, comprehensive oral rehabilitation, oral cancer screening, simple and surgical extractions, dentures, root canals, and gum treatment. For a complete list of services, please view our Services page. Children are always welcome and wanted at our clinic. For more information visit our Contact Us page. You may also schedule an appointment online using our Schedule Appointment feature.